NEWPORT NEWS, Va., Jan. 26, 2013 (GLOBE NEWSWIRE) -- Huntington Ingalls Industries (NYSE:HII) celebrated significant progress today as the 555-metric ton island was lowered onto the nuclear-powered aircraft carrier Gerald R. Ford (CVN 78) at the company's Newport News Shipbuilding (NNS) division. The island will serve as the command center for flight deck operations aboard the first of the next-generation class of aircraft carriers. 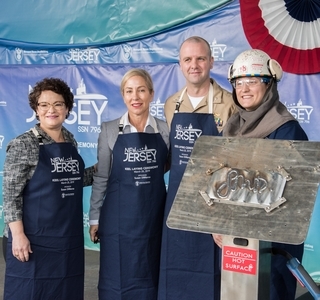 "The Gerald R. Ford continues our tradition of building quality ships," said NNS President Matt Mulherin. "It is our duty, our responsibility and--indeed--our great privilege because we know CVN 78 will provide American presence and diplomacy anywhere she is needed. She will be home to thousands of sailors, and she will keep President Ford's legacy alive for future generations." Susan Ford Bales, daughter of the late President Gerald R. Ford and Betty Ford, serves as the ship's sponsor and participated in the event. "Shipbuilders--thank you for your extraordinary work," she said. "You are a national treasure. Thank you very much." Ford Bales also placed items under the island during the mast-stepping, an ancient Roman ceremony in which coins were put into the mast of a ship to ensure safe passage and good luck. Ford Bales placed a sandstone piece made of the same sandstone used in the construction of the White House and the U.S. Capitol. The piece was embedded with a unique coin designed by Ford Bales, as well as five official seals representing her father's service to the nation. "The Gerald R. Ford represents an incredible engineering achievement—truly a wonderful blend of technical know-how and American heavy metal," said Rear Adm. Ted Branch, commander, Naval Air Force Atlantic. "This ship will operate until about 2065 or beyond." 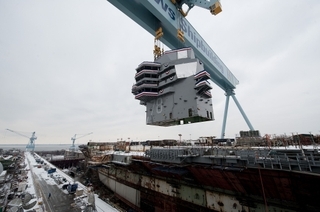 Gerald R. Ford is being built using modular construction, a process where smaller sections of the ship are welded together to form large structural units, equipment is installed, and the large units are lifted into the dry dock. 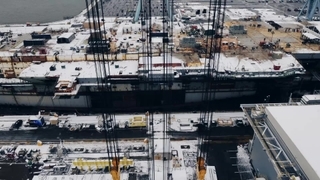 The 60-foot long, 30-foot wide island represents the 452nd lift of the nearly 500 total structural lifts needed to complete the ship. At this stage in construction, Ford is about 90 percent structurally complete. "When the island is landed, Gerald R. Ford will take on that distinctive and unmistakable profile of an aircraft carrier," said CVN 78's prospective commanding officer Capt. John Meier. "Its profile will be easily recognizable; it belies the advancement of essentially every system aboard the ship. Simply put, this is not your father's aircraft carrier." The island is redesigned on Ford to incorporate the latest technology in flat-panel array radar systems and dual-band radar that provides improved functionality. It is shorter in length but stands 20 feet taller than islands on previous aircraft carriers. Its placement is 140 feet further aft and 3 feet further outboard than previous carriers to improve flight deck access for aircraft operations.The first-in-class ship also features a new nuclear power plant, electromagnetic catapults, improved weapons movement, an enhanced flight deck capable of increased aircraft sortie rates, and growth margin for future technologies and reduced manning.